This is the fourth poster in this series from Roger Evernden focusing on the practicalities of using Building Blocks. This one looks at how Building Blocks are used to create architecture roadmaps. Surprisingly, the TOGAF documentation doesn’t say much about creating and using roadmaps. Its definition of a roadmap is "an abstracted plan for business or technology change, typically operating across multiple disciplines over multiple years. Normally used in the phrases Technology Roadmap, Architecture Roadmap, etc." 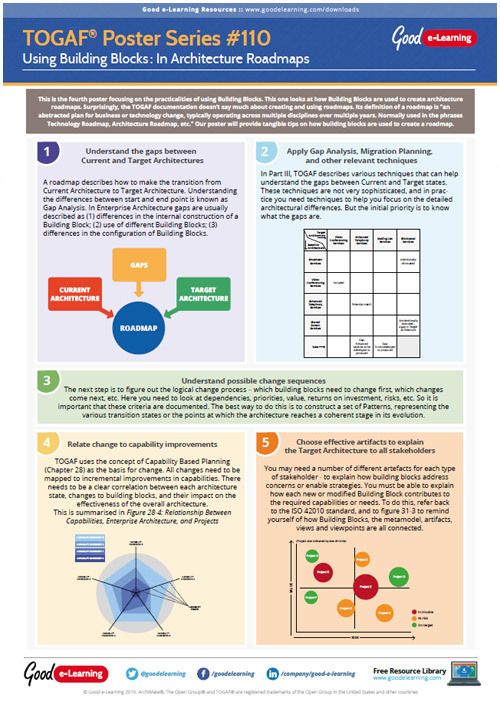 Our poster will provide tangible tips on how building blocks are used to create a roadmap.